I have to be honest: I didn't think that I would feel the need to spill some (virtual) ink this early into 2017. Well. Okay. Seems like rolling my eyes wouldn't quite do the job. Look, everybody has different opinions on fashion trends, that's just the way it is. You either like over-the-knee boots or you don't, you're either on board of the bomberjacket train or you're not. And that's okay! Better even: that's normal, and healthy. You don't need to copy every trend there is just because the masses tell you to do so. But what isn't okay, is doing what this last paragragh does: bashing men who wear chokers. Let's face it: there's a whole list of things I don't get about this world, but tearing others down because of what/who they like or what they wear is probably somewhere at the top of said list. I understand it's possible to not like a trend, but that doesn't mean you should ridicule others that embrace it, right? What bugs me the most, is the fact that content like that gets a platform on a big outlet like GQ magazine. Whether you like it or not, as an online magazine, you are playing an exemplary role for your readers, especially if you reach a large audience. That doesn't mean magazines can't voice their opinions, on the contrary: sparking a discussion is one of the most interesting things you can do. The problem here is the approach. With this article, the writer justifies the mocking of people who wear things that don't necessarily fit the norm. When you read people's reaction to this article on social media, you don't get a lot more than giggly, scoffing reactions or men and women tagging their friends 'for the lolz', asking them 'if this wouldn't be a GREAT birthday present'. That's the kind of reactions you get ftom articles like this. It's one thing to voice an opinion, it's another thing to voice an opinion and hurt/ridicule/denigrate others while doing so. What strikes me the most, is how a lot of online platforms that normally preach individuality and self-acceptance, now jump on the judging bandwagon that GQ has launched, without a doubt. How contradictory can one be? If one of the biggest Dutch magazines, known for being progressive and openminded, suddenly publishes articles that follow the path of the GQ one, what kind of signal are we giving towards the reader? And then there are the boys, insecure teenagers searching for their identity, just like me a couple of years ago, reading those articles and feeling worse than they already did. Looking in the mirror, wondering what is wrong with them. The importance of positive representation in (online) media can't be underestimated, and neither can the influence of media on the public opinion. And don't get me wrong, I know how online media works, generating clicks through appealing or scandalous headlines is one of the most frequently used techniques in media these days. But maybe we should take a moment and consider the consequences of clickbait. More often than not, people only see the sensational headline coming by while they're scrolling through their feed, and bang, the evil has been done. 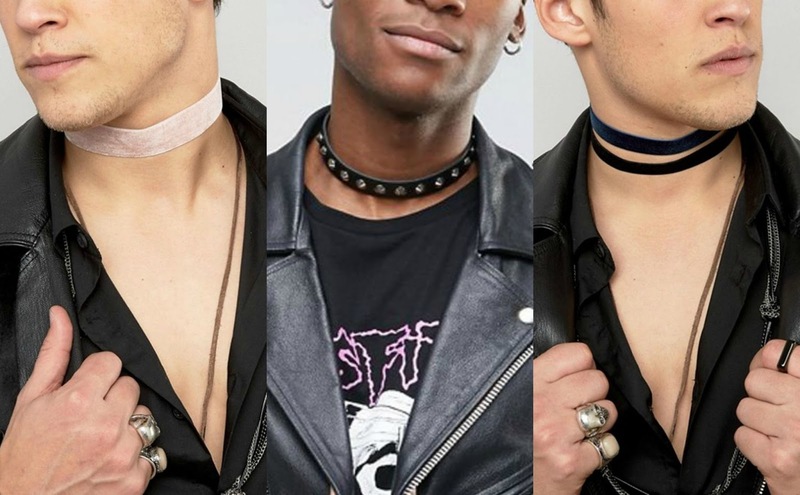 Let men wear chokers, and go ahead and build your opinion on that. It isn't for you? Don't wear it. It's as easy as that! But don't deprive others from the fun that is fashion: experimenting, self-expression,... The world is a better place with people in it who colour outside the lines some times, it keeps things interesting. Live and let live, it isn't that hard, whether you choose to do it with or without a choker around your neck. Goed gesproken! Een artikel met de titel "OH NO: er bestaan nu ook chokers voor mannen" passeerde daarnet op mijn facebook en die sprong meteen bij mij in het oog. Ik weet niet of het de intentie van het artikel was maar je zou heel makkelijk kunnen denken dat ze daarmee bedoelen dat chokers sowieso niet voor mannen zijn. Laat iedereen toch dragen wat men wil dacht ik dan! Het is natuurlijk normaal dat mensen een mening hebben over wat voor hen wel of niet mooi is of wel of niet hun stijl is maar dat geeft niemand een reden om te zeggen dat de ander daarom fout is. Leven en laten leven is een zeer mooi idee en de wereld zou een mooiere plek zijn moesten meer mensen hiervan uitgaan (en dan niet enkel op vlak van mode of sociale media).